65% of the world operates with ‘honour and shame’ culture, including 90% of unreached people groups. What is honour and what is shame? Are they biblical themes? How should we understand the cultural scripts around them? What happens when we read the Bible through the lenses of honour and shame? And what is the good news for those living under shame or honour? You are invited to the annual CMS Spring Dinner! Join us for a night of crossing cultures, hearing stories, meeting friends and joining together to see a world that knows Jesus. 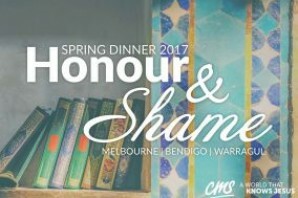 This year our Spring Dinner will explore this theme of honour and shame and the Bendigo event will be part of the Bendigo CMS Weekend. Please join us for the Spring Dinner and hear about how engaging with honour and shame will give light to how you read the Bible, how you pray for God’s world, and how you engage in cross-cultural mission. You can register for the dinner by completing the registration for the Bendigo Weekend and nominating your attendance at the Saturday evening – 14th October.